(Review by Ann Alex/photo by Lance). I didn’t get the chance to hear as much of the Concourse performances as I would have liked this year. 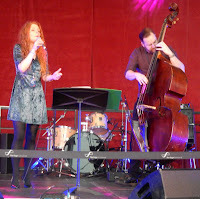 However, I did manage to catch Zoe Gilby (voice) and Andy Champion, (double bass) on Saturday. Not many singers would dare to perform with just bass accompaniment, but Zoe is fearless, fine-voiced and flexible, with an interesting mix of songs. Her husband Andy plays bass to-die-for, brilliant, tuneful, exciting music. They began with Way Down In The Hole; then a standard Our Love Is Here To Stay. The rest of the programme was of songs not normally thought of as jazz, but they worked well with jazz interpretations. There was Pink Floyd’s Money; Kashka From Baghdad (from Kate Bush’s Lionheart album) and Nick Drake’s Riverman. The following day, Sunday, Zoe and Andy played a support set to Sheila Jordan, the report of which will be posted separately. Getting back to my more (to others) mundane duties, I’d recommend everyone to serve on a stand at a jazz festival. It’s a great way to meet people. Within about 10 minutes of taking my seat on Friday evening, I had greeted and/or chatted to a dozen people that I knew. But since my job on the stand was to publicise the Jazz Co-op, it was maybe more important to talk to those I didn’t know and to hand out gig lists. So I chatted to a man who instructed me in exactly how to play the violin, even providing a simple diagram. He is new to jazz so I told him about Gypsy Jazz, which he could well be checking out on the internet as I write. I greeted a couple of folkies with diverse musical tastes, who’d actually come to see Chris Barber. The House Of The Black Gardenia on Sunday teatime was another high spot with superb swing dancing. The Concourse was crowded, including people on the stairs, quite a buzz for a brilliant band reviewed elsewhere. In fact, you could have a great time without moving from the Concourse, and it’s all free so you’d just need money for a drink or two (or three). This year you could have seen such as the young person’s band Jazz Attack, or John Pope and Mark Williams, and many others.